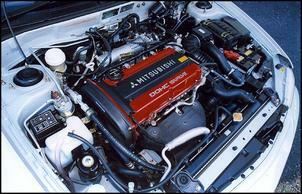 The evolution of the Mitsubishi 4G63 2-litre turbo engine. 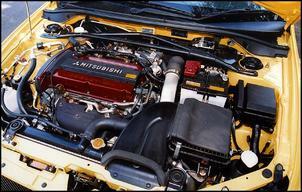 One of the longest-serving performance engines of the modern era is the Mitsubishi 4G63 Turbo. This 2-litre in-line four has powered the Japanese company to countless rally victories since the late ‘80s – and it continues to provide excellent bang for buck in the current Lancer Evo. 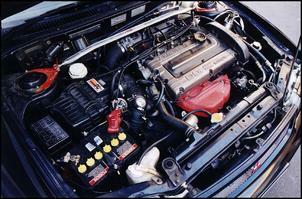 The first use for the 4G63 Turbo was in the Japanese spec Galant VR-4 and Eterna ZR-4 of 1988. The 4G63 Turbo employs a 85mm bore and 88mm stroke to displace a total of 2 litres and breathes through a DOHC, 16-valve head. The iron block is also fitted with a pair of balance shafts that reduce vibration and, in early turbo form, the static compression ratio is a relatively low 7.8:1. These early examples also use a dual-stage ‘Cyclone’ intake manifold, TD05H-14G turbocharger and a generously sized front-mount air-to-air intercooler. Output is 151kW at 6000 rpm and 294Nm at 3000 rpm. The only gearbox available initially was an AWD 5-speed manual. In 1989 the engine was tweaked to deliver 162kW in 5-speed manual versions. We believe this extra power comes from ECU tuning changes. A 4-speed auto version was also introduced but it’s detuned to 154kW (though still with 294Nm peak torque). The next year brought another power increase for the Japanese VR-4 – some RS and ‘Evo O’ versions came with a larger TD05-16G turbocharger that helps deliver a substantial 176kW along with 304Nm of torque. Auto versions remain pegged at 154kW/294Nm. Nineteen-ninety also saw the release of the Eclipse GSR coupe with an optional 4G63 Turbo engine. The Eclipse was a popular export car for Mitsubishi and, not coincidentally, uses the same engine as the Australian delivered VR-4. Interestingly, the Eclipse turbo is available with an AWD or FWD gearbox – it’s the only 4G63 Turbo car with the option of front-drive. And it was about now Mitsubishi decided to get deadly serious with the 4G63. To create the first ‘Evolution’ Lancer in 1992, Mitsubishi ditched the 1.8-litre turbo engine found in the go-fast Lancer GSR and dropped in a reworked version of the VR-4 4G63 Turbo. The Evolution 1-spec 4G63 features a big air-to-air intercooler, Inconnel turbine TD05-16G turbo, a higher static compression ratio (8.5:1), modified port configuration, new injectors and a lighter piston, conrod and crankshaft assembly. These changes netted a maximum of 184kW at 6000 rpm and 309Nm at 3000 rpm. The rev limit in these early Evo Lancers is set to 7500 rpm. 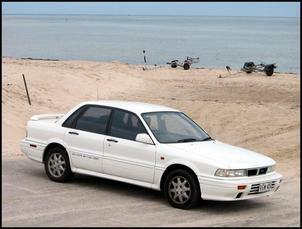 In 1994, Mitsubishi released the updated Evolution 2 Lancer. It appears that the E2 engine is the same as the previous version except tuning changes provide slightly more power – 191kW at 6000 rpm. Also in 1994, the Japanese market received a slightly unusual recreational AWD with a 4G63 Turbo engine – the RV-R. 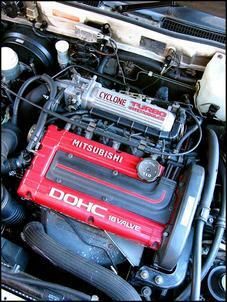 The RV-R engine is based on the Lancer Evolution 1’s except it’s fitted with a smaller TD04HL turbocharger. Output is 162 - 169kW at 6000 rpm and 278 - 289Nm at 2500 rpm depending on transmission - an auto and 5-speed manual version are available. In 1995 Mitsubishi released the Lancer Evo 3 which brought a big aero kit and a 4G63 producing 199kW at 6250 rpm. 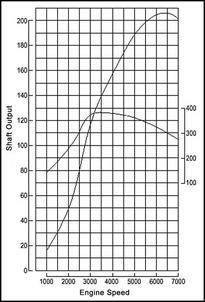 The biggest difference over the previous model is a larger turbo compressor and higher static compression ratio (9:1). 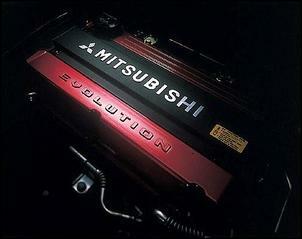 In 1996 Mitsubishi introduced the new-look Lancer Evolution 4 and a totally revised engine layout. In previous models, the 4G63 had been designed with the cam drive system on the right side of the engine bay and the flywheel on the left (as viewed from the interior). But for the Evo 4 (and all subsequent models) the orientation was changed – the cam drive is on the left side and the flywheel is on the right side. 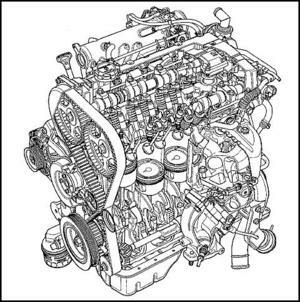 The Evo 4’s camshafts are a ‘high-speed’ design, there are lightweight pistons (providing a lower 8.8:1 static compression ratio), a straight-runner intake manifold, metal head gasket and an improved exhaust manifold. A twin scroll version of the TD05 turbocharger is also used to enhance boost response. 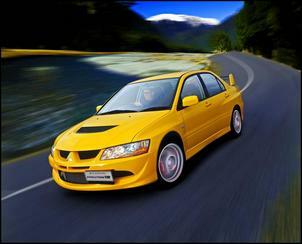 In 1998, Mitsubishi released the Lancer Evo 5. The E5 uses essentially the same engine the previous model except the turbocharger is slightly larger and boost pressure is bumped up. These subtle changes yield a noticeable improvement – a claimed 206kW (but more realistically 230kW) along with 373Nm of torque at 3000 rpm. The Evolution 6 Lancer made an appearance in 1999 and, although power and torque figures remain the same, overall engine reliability is improved. Cooling channels are added to the pistons, the coolant passage layout is revised (to prevent water pump cavitation), a larger oil cooler is added and the sump incorporates altered baffles. The rev limit is also increased slightly (from 7500 to 7600 rpm), an Inconnel turbine wheel is employed in the E6 GSR while RS versions are available with a titanium-alloy turbine wheel. The Evo 6 was later updated with the limited edition Tommi Makinen (aka Evo 6.5). The Makinen’s engine is identical to the Evo 6 except the RS version’s titanium-alloy turbine turbocharger is used with a less aggressive compressor wheel. As a result, peak torque (373Nm) arrives at lower revs than previously – 2750 rpm. The ‘grown up’ Lancer Evolution 7 appeared on the Japanese market in 2001. The E7-spec 4G63 employs hollow camshafts, a revised intake manifold, bigger oil cooler, twin-scroll turbo (with an Inconnel turbine wheel in GSR versions and a titanium-alloy wheel in the RS), triple water spray nozzles for the intercooler and a low restriction exhaust. Peak power is, of course, a politically correct 206kW and there’s up to 383Nm of torque (now at 3500 rpm). A 5-speed gearbox is standard. 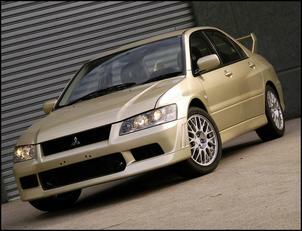 Interestingly, Mitsubishi also introduced an automatic version of the Evo 7 which uses a detuned engine. 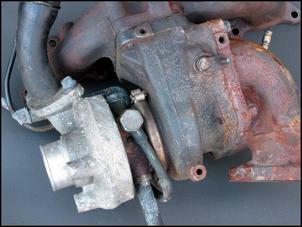 The auto trans E7 – known as the GT-A – uses a smaller turbo than the manual version and there is no secondary air injection hardware installed. The output of the Evo 7 GTA 4G63 Turbo is 200kW at 6500 rpm with 343Nm at a low 2750 rpm. 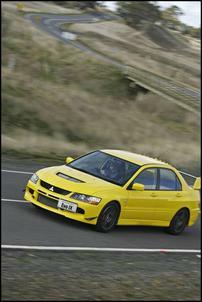 In late’02, the Evo 7 was replaced by the (you guessed it) Evo 8. The Evo 8 has a few mechanical changes aimed at improving overall strength and efficiency. You’ll find an improved water pump and enlarged water passages in the turbocharger, forged steel conrods and heavy-duty aluminium pistons. Engine weight is also reduced using a new exhaust manifold, revised valvetrain and new air conditioning brackets. The lightweight air conditioning brackets are the easiest way to identify this engine over the E7 version. A 6-speed gearbox is also found on certain models. Evo 8s exported to North America are tuned for low emissions and to cope with lower octane fuel - and, as a result, output is sacrificed. In 2004 versions, peak power is 202kW and torque maxes at 370Nm. The current 2005 model (including the lightweight MR version) has been upgraded to 206kW. Interestingly, the Evo 8 sold in Australia has even less power and torque – 195kW and 355Nm. The latest role for the 4G63 Turbo is in the snout of the newly released Evo 9 Lancer. Mitsubishi has also released the Evo 9 (in detuned form) to the Australian and US markets. Both versions generate a genuine 206kW/355Nm – better than previous export models but still a long way short of the Japanese-spec version. Whatever the case, some aftermarket exhaust, air intake and ECU tuning will have most late-model 4G63 Turbos producing similar grunt. All are strong and there are plenty of aftermarket parts to suit – there’s nothing to stop you pumping out 300 kilowatts with relatively few mods.